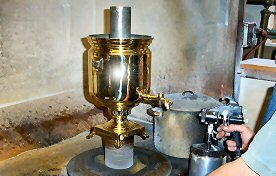 For over 40 years, Brassworks has specialized in restoring all brass, copper & silver to it's original beauty. After refinishing, lacquer is applied to prevent further oxidation. For years, Brassworks has provided restoration services all across the country. To receive a free quote, just email photos and a brief description to: info@baltimorebrassworks.com and one of our experts will get back to you soon. Or call us at (410) 686-7280. Brassworks is a full service repair shop. We specialize in dent removal, soldering, high temperature brazing and silver repair. We can mend, fabricate and provide replacement parts for most anything. Don't throw out that old lamp. Most lighting fixtures can be rewired inexpensively. Rewiring services include new cord sets, sockets, harps, finials, switches and more. Our trained experts can safely re-electrify your lamp, chandelier, sconces, etc. 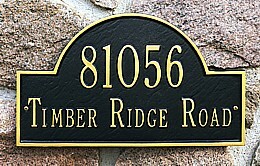 Brassworks is an authorized dealer for Whitehall products, a supplier of elegant personalized address plaques. Each plaque is hand-crafted in the USA from rust-free recycled aluminum. Choose you background and letter colors. Stop in our shop and browse the different shapes and color variations. Customer satisfaction is first and foremost. Every piece we handle will receive the highest quality workmanship possible. Expect 1-3 weeks for delivery.